It’s a glorious December morning on the Big Island of Hawaii. At 8am, there aren’t any early-bird visitors, except staff to cut, trim, water, or rake parts of the golf course. I’m on the Mauna Kea Golf Course, but I’m not about to tackle the 409-yard par-4 13th hole. Instead, I have to leave the sweet digs at the Hapuna Beach Prince Hotel, and fly to Honolulu in a few hours to catch another hop onto the mainland. Before I leave, I’m saying hello to Kohala, an extinct shield-volcano anchoring the northwest corner of the island. I made the photo above on 8 December 2009 with a Canon EOS450D camera, EF 70-300 zoom-lens, and the following settings: 1/1250s, f/4.5, ISO200, and 115mm focal length (184mm full-frame equivalent). Gotta love the USGS topo-surveys for providing names to geological and geographical features. This post appears on Fotoeins Fotopress at fotoeins.com as http://wp.me/p1BIdT-7KC. Should any plane develop trouble going between SFC and FLT 350, I suppose that the first fingers of blame would be pointed at the very same agencies monitoring European airspace. The accusations would fly: the airspace authorities were not sufficiently careful to warn airline companies of the inherent dangers of flying through ash, and these authorities were being careless to put airline-staff and their customers at risk. Well, I guess if the companies are yelling the loudest, they must all be true, all of the time. – HL, 2105h GMT, 19 April 2010. 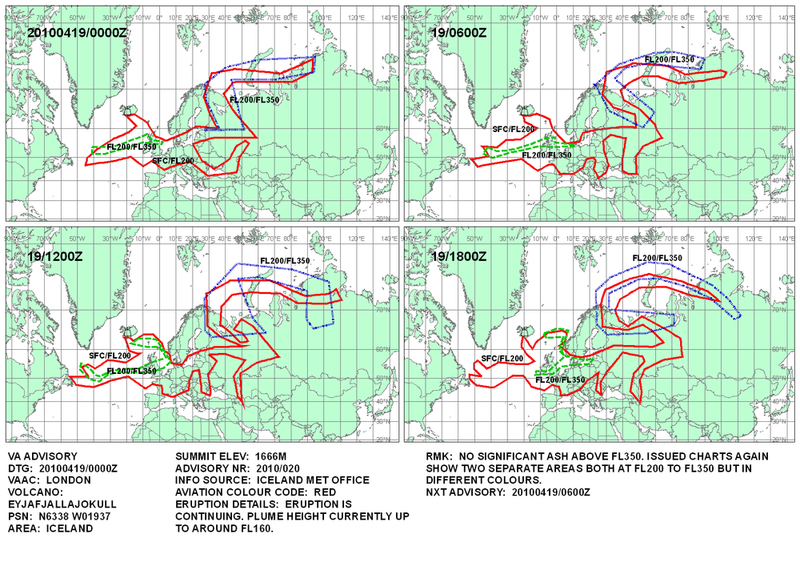 See also this BBC article regarding British Airways flight 009 (24 June 1982) and how the Boeing 747 lost all four engines as the plane went into an ash cloud, and the Wikipedia article for more information about the flight. As always, your kilometrage may vary. The absurd – MAD, or even FCO, as “major” gateways? one might imagine that the volcano Eyjafjallajokull will continue to huff and puff for days. The next on offer might be to conceive some interesting options for gateways into the European continent. If disruptions to flight-ops for LHR, FRA, CDG/ORL, AMS, ZRH, etc. were to continue, one might envision the (crazy?) possibility of using Madrid (MAD) or even Rome (FCO) as alternative gateways into which a number of major transcon flights would enter the European continent, assuming approved ascents and descents between surface and flight-level 35,000 feet (SFC and FLT 350). As MAD appears to be in a zone relatively free of ash (see UK MetOffice map above), questions raised about the possibility of utilizing MAD as a “high-tier European hub” would include: terminal and facility capacity for increased numbers in inbound/outbound pax, in airline- and ground-staff, as well as gate-capacity and pax-controls (as well as the controlled separation between Schengen and non-Schengen traffic). Since MAD is an Iberia and OneWorld hub and is already served by various AA and IB non-stops (for example, to North- and South America), diverting additional AA, IB, and BA transcon/transat traffic to MAD from LHR or FRA might not seem so problematic. The fun begins when one begins thinking about incorporating operations by other transcon carriers from North America, the Middle East, and Asia, let alone the inclusion of Lufthansa, which operates the lion’s share of air traffic within Europe. As a whole, picturing an alternative means of entering Europe in an “ash-free” zone and how the facility like MAD would cope with additional capacity were both worth a moment’s pause. Yeah, it’s crazy, and I might be wrong, but it’s just a thought.